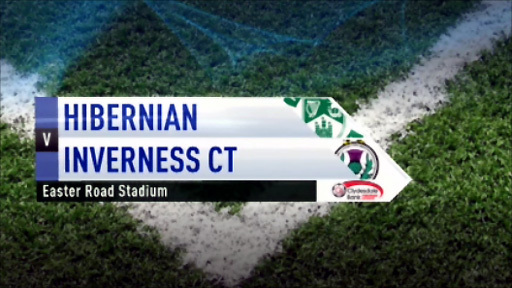 Hibernian claimed a fourth successive Scottish Premier League win after overcoming Inverness at Easter Road. The hosts came close to breaking the deadlock just after the half-hour mark, when Victor Palsson's header was cleared off the line by Russell Duncan. But Callum Booth did find the net for Hibs with a stunning strike into the top corner in the 58th minute. Ross Tokely missed a good chance to level before Lewis Stevenson's deflected shot sealed Hibs' win. Hibs, now 13 points clear of bottom club Hamilton, remain in 10th place but are edging towards top-six contention, while the Highlanders missed the chance to move up one spot to fifth. Inverness started brightly and Adam Rooney was unsuccessful with a chipped shot after nipping in ahead of defender Francis Dickoh and lobbing into the arms of Graham Stack. Hibs began to assert themselves and Akpo Sodje fired wide before Martin Scott shot into the grasp of Ryan Esson. Esson was called into action again when David Wotherspoon curled an effort towards goal, the keeper blocking well before Derek Riordan hammered the rebound into the side netting. Rooney threatened again after meeting Richie Foran's cross and Stack made an important block with his legs. Riordan tested Esson with a left-foot shot and, from the resulting corner, Victor Palsson's header was cleared off the line by Russell Duncan. The home side continued to enjoy the ascendancy but were unable to make the most of their possession in the closing stages of the first half. Esson collected an effort by Riordan just after the interval before, at the other end, Stack raced from his line to get in the way of Rooney's latest effort. Sodje sliced wide from a decent position as chances continued to crop up at both ends. However, Hibs continued to probe and left-back Booth received Riordan's pass to the edge of the box and caught the ball perfectly to lift a shot over Esson and into the far corner. Riordan went in search of a second Hibs goal with a shot that required a one-handed save from Esson, although Palsson would have been well-placed for a tap-in if his team-mate had elected to pass. Having demonstrated his attacking prowess, Booth made an important defensive intervention when he headed away from under his own crossbar as Inverness looked for an equaliser. The Highlanders should have drawn level when Aaron Doran's corner was headed back across goal by Richie Foran to Ross Tokely, who fired over. Palsson drew a save from Esson before playing a major part in Hibs' second goal in the 89th minute. The Icelandic midfielder played a one-two with Booth before finding Sodje, who set up substitute Stevenson to curl a shot past Esson with the aid of a deflection. Stack blocked another effort by Tokely as Inverness missed out on a late consolation. 90:00+2:32 The referee blows for the end of the match. 90:00+1:24 Outswinging corner taken right-footed by Aaron Doran, Francis Dickoh manages to make a clearance. Inswinging corner taken by Aaron Doran from the left by-line, comfortable save by Graham Stack. 90:00+0:28 Lewis Stevenson fouled by Aaron Doran, the ref awards a free kick. Callum Booth crosses the ball from the free kick left-footed from left wing, Chris Hogg manages to make a clearance. 88:52 GOAL - Lewis Stevenson:Hibernian 2 - 0 Inverness CT Lewis Stevenson finds the net with a goal from just outside the area to the bottom right corner of the goal. Hibernian 2-0 Inverness CT.
88:03 Ross Tokely challenges Lewis Stevenson unfairly and gives away a free kick. Paul Hanlon restarts play with the free kick. 87:17 Unfair challenge on Chris Hogg by Akpo Sodje results in a free kick. Chris Hogg takes the free kick. 86:03 Free kick awarded for a foul by Matt Thornhill on Alex MacDonald. Direct free kick taken by Stuart Duff. 86:03 Substitution Shane Sutherland on for Adam Rooney. 86:03 Substitution Colin Nish comes on in place of Derek Riordan. 84:24 Centre by Akpo Sodje. 83:50 Richie Foran crosses the ball, Paul Hanlon manages to make a clearance. 81:57 Free kick awarded for a foul by Aaron Doran on Callum Booth. Direct free kick taken by Graham Stack. 80:58 Alex MacDonald gives away a free kick for an unfair challenge on Martin Scott. Graham Stack takes the free kick. 80:29 Victor Palsson takes a shot. Save made by Ryan Esson. 79:40 Centre by Richie Towell. 77:56 Free kick awarded for an unfair challenge on Victor Palsson by Adam Rooney. Free kick taken by Richie Towell. 76:55 Substitution Lewis Stevenson comes on in place of Liam Miller. 71:54 Corner taken by Aaron Doran, Ross Tokely produces a right-footed shot from inside the area that goes over the bar. 68:26 Substitution Alex MacDonald is brought on as a substitute for Russell Duncan. 67:16 Derek Riordan takes a shot. Ryan Esson makes a save. Inswinging corner taken by Liam Miller, Foul by Paul Hanlon on Richie Foran, free kick awarded. Direct free kick taken by Ryan Esson. 66:15 Free kick awarded for an unfair challenge on Nick Ross by Victor Palsson. Chris Hogg takes the free kick. 64:41 Inswinging corner taken from the left by-line by Liam Miller, Adam Rooney manages to make a clearance. 63:36 Paul Hanlon concedes a free kick for a foul on Richie Foran. Stuart Duff takes the direct free kick. 63:05 Substitution Matt Thornhill comes on in place of David Wotherspoon. 62:35 The ball is crossed by Martin Scott, Stuart Duff manages to make a clearance. 60:47 Unfair challenge on Richie Towell by Richie Foran results in a free kick. Richie Towell takes the direct free kick. 59:36 Outswinging corner taken from the right by-line by Aaron Doran. 57:27 The assist for the goal came from Derek Riordan. 57:27 GOAL - Callum Booth:Hibernian 1 - 0 Inverness CT Callum Booth scores a goal from just outside the area to the top right corner of the goal. 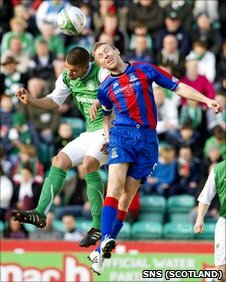 Hibernian 1-0 Inverness CT.
56:07 Free kick awarded for an unfair challenge on Russell Duncan by Martin Scott. Ryan Esson takes the free kick. 55:25 Akpo Sodje has shot on goal from just outside the area which goes wide of the right-hand upright. 55:25 Substitution (Inverness CT) makes a substitution, with Nick Ross coming on for Eric Odhiambo. 54:41 Aaron Doran is caught offside. Graham Stack restarts play with the free kick. 53:51 Victor Palsson produces a right-footed shot from just outside the box that goes wide right of the goal. 52:30 Centre by Callum Booth, Shot by David Wotherspoon from deep inside the penalty area misses to the right of the target. 51:35 The ball is crossed by Derek Riordan, save by Ryan Esson. 49:58 Free kick awarded for an unfair challenge on Akpo Sodje by Chris Hogg. The free kick is swung in right-footed by Liam Miller, Richie Foran manages to make a clearance. 49:13 Effort on goal by Akpo Sodje from inside the penalty box misses to the right of the target. 48:41 Shot by Lee Cox from 20 yards. Save by Graham Stack. 48:05 Adam Rooney takes a shot. Save made by Graham Stack. 46:30 Derek Riordan takes a shot. Save by Ryan Esson. 45:00+0:19 The ref blows to signal half-time. 44:19 The ball is swung over by Martin Scott, save by Ryan Esson. 43:30 Victor Palsson crosses the ball, Ryan Esson makes a save. 41:08 Akpo Sodje concedes a free kick for a foul on Russell Duncan. Chris Hogg restarts play with the free kick. 40:33 Derek Riordan delivers the ball, save made by Ryan Esson. 39:17 Free kick awarded for an unfair challenge on Martin Scott by Ross Tokely. Free kick taken by Liam Miller. 38:19 Foul by Akpo Sodje on Richie Foran, free kick awarded. Free kick taken by Ryan Esson. 36:46 The assistant referee signals for offside against Richie Foran. Graham Stack takes the free kick. 35:57 Foul by David Wotherspoon on Aaron Doran, free kick awarded. Direct free kick taken by Grant Munro. 33:35 Inswinging corner taken right-footed by Aaron Doran, save by Graham Stack. 31:32 Foul by Liam Miller on Lee Cox, free kick awarded. Free kick taken by Stuart Duff. 30:05 Derek Riordan takes a shot. Save made by Ryan Esson. Inswinging corner taken from the left by-line by Callum Booth, Victor Palsson takes a shot. Richie Foran makes a clearance. 27:05 A cross is delivered by Lee Cox. Richie Foran is flagged offside by the assistant referee. Free kick taken by Graham Stack. 26:39 Unfair challenge on Richie Foran by Richie Towell results in a free kick. Direct free kick taken by Grant Munro. 26:06 Shot from deep inside the area by Akpo Sodje goes over the bar. 24:38 Liam Miller fouled by Lee Cox, the ref awards a free kick. Richie Towell takes the direct free kick. 23:55 Victor Palsson takes a shot from just inside the penalty box which clears the crossbar. 20:41 David Wotherspoon produces a cross. 17:58 David Wotherspoon delivers the ball, Aaron Doran makes a clearance. 13:26 Corner from the left by-line taken by Liam Miller, save by Ryan Esson. 13:08 The official flags Richie Foran offside. Graham Stack takes the indirect free kick. 12:10 Richie Foran produces a cross, Adam Rooney takes a shot. Save made by Graham Stack. 11:14 Shot by David Wotherspoon. Save by Ryan Esson. Derek Riordan produces a left-footed shot from just outside the box that goes wide right of the target. 10:20 Martin Scott takes a shot. Ryan Esson makes a save. 9:52 Richie Foran sends in a cross, clearance made by Richie Towell. 8:20 Centre by Stuart Duff, save by Graham Stack. 6:46 The assistant referee signals for offside against Aaron Doran. Graham Stack restarts play with the free kick. 6:01 Effort from deep inside the area by Akpo Sodje misses to the left of the target. 3:31 Adam Rooney takes a shot. Save made by Graham Stack.